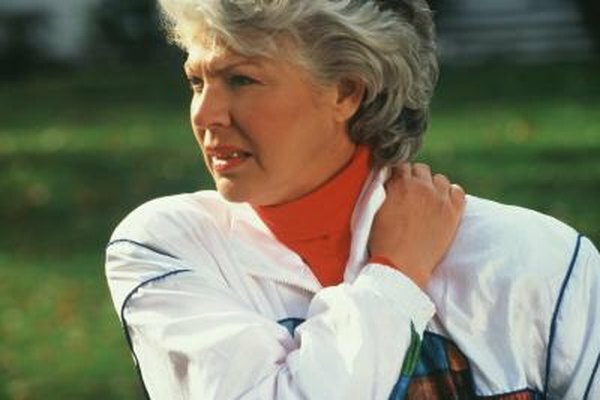 A dropped shoulder results from shoulder separation, an injury that occurs to the soft tissue between the clavicle and scapula at the acromioclavicular joint, according to the American Academy of Orthopaedic Surgeons. The severity of the injury can range from a mild strain to a full tear, and rehabilitation is performed by strengthening the muscles of the shoulder, back and chest through the various ranges of motion. Stand with your hands at your sides, palms facing your legs. Slowly raise both arms out to either side until your arms are as far overhead as they will go. Maintain the position for at least five seconds before lowering your arms, and repeat the movement a total of 10 times. This exercise will work the deltoids, pectorals and lats. Hold a long, straight stick in both hands with the stick resting against the back of your legs and your palms facing backward. Raise the stick backward as far as you can, and maintain the position for at least five seconds. Repeat the movement a total of 10 times. Extension means to increase a joint angle -- in this case, primarily using the pectorals and lats with help from the teres major, according to ExRx.net. Stand with your arms at your sides and perform a shrug motion so that your shoulders rise straight up, arms remaining at your sides. Roll your scapulae backward and downward. Raise them back up to the shrugged position to complete the cycle. Repeat this movement for a total of 10 times. This exercise works the trapezius, infraspinatus and deltoids. Once your shoulder heals enough to bear weight, the bent row can increase your extension strength. Grab a dumbbell in one hand, place the other hand on a bench and lean over. Row the dumbbell upward as far as you can, then lower it back to the starting position. Repeat for a total of 10 times. This exercise will work the trapezius, infrapsinatus and teres major muscles. Floor presses are an advanced shoulder rehab exercise for those who are far along in their dropped shoulder rehabilitation. Lie flat on your back on the floor with a dumbbell in either hand. Start with the dumbbells extended straight overhead. Lower them until your elbows touch the floor, and pause for one second before pressing them back overhead. The press back up should be a quick motion. Repeat for a total of 10 times. This exercise works your pectorals and triceps.